The nation’s most selective colleges and universities should give special preference in the admissions process to qualified students from low-income families, who are vastly less likely to attend those schools than wealthier Americans with similar academic ability, according to a new report. These include preferences for athletes, children of alumni, and applicants whose families have the greatest ability to pay, who often receive financial aid based not on need but on what the universities call merit. 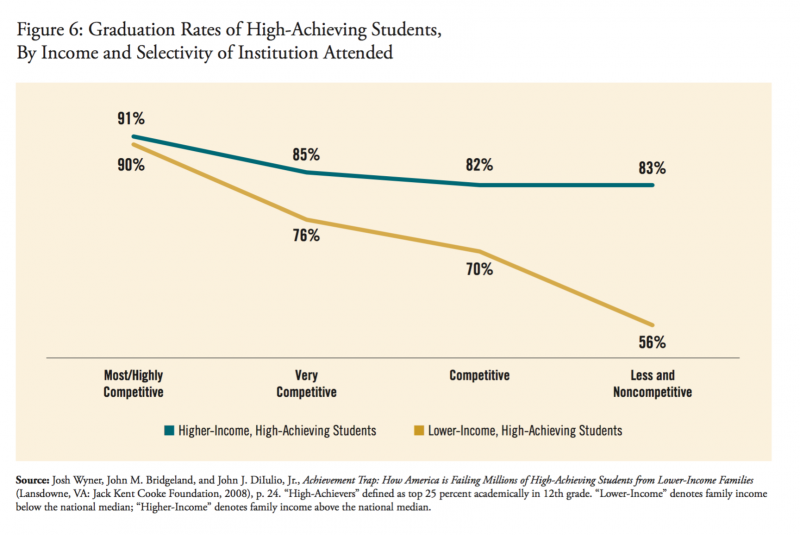 The report defined selective institutions as those that receive more applicants than they accept, and whose students have high levels of academic preparation. It combined the “most competitive” and “highly competitive” classifications of Barron’s Profiles of American Colleges. Seventy-two percent of students in the most competitive institutions come from the wealthiest one-quarter of families, the report said, while only three percent come from families in the bottom socioeconomic quarter. A separate analysis of federal data by the Hechinger Report has shown that this divide is getting wider. Among the reasons: Low-income students are less likely to apply to the best colleges, thinking they cannot get in or won’t be able to afford tuition. But the report said they also get inadequate consideration in the admissions and financial-aid process. While coaches lobby for athletes and trustees advocate for the children of potential donors, it said, there is no one to stand up for low-income students. Legacy applicants, for example, or children of alumni, have much higher odds of acceptance than other students, the report said. Harvard, it said, admits 30 percent of them, for instance—four times the rate at which it accepts non-legacy applicants. The report called for eliminating legacy preferences, providing more outreach to, and financial aid for, low-income students, and redefining “merit” to include the achievement of overcoming a low-income background and succeeding academically. “Such an approach would recognize that to overcome the burdens of poverty and nonetheless perform at a high level is itself an indicator of ability and perseverance,” the report said.